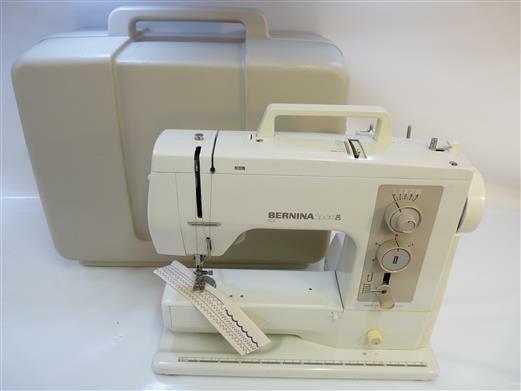 This BERNINA 801 SPORT is in great condition and has just arrived. It's a mechanical sewing machine that's perfect for general purpose sewing tasks. It's a heavy duty machine which makes it perfect for schools/colleges and other educational establishments which robustness is a must. The machine includes a simple set of 7 straight stitches, zig zag, blind helm and embroidery stitches - all you need for many of your everyday sewing projects. It also has length and width controls and reverse sleeve arm. Also included with this machine are the foot control, instruction book, extension table, hard carry case cover cover & accessories box with many bobbins, needles and extra feet - all of which are in great condition. Recently serviced and well looked after. This is a Genuine Swiss Made Bernina!